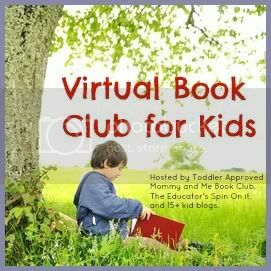 For the Virutal Book Club For Kids we read The Cow Who Clucked . I found this books to be a long to fun. You can explore the sounds that each animal makes. It is fun to pause for the kids to say “Cluck, Cluck” for the cow. For this activity, since we are doing the 30 Days of Moving with Kids Challenge, I thought it would be fun to do a book gross motor activity. These are always fun and we enjoy them. What you need: the book and room to move. There are several different animals in the book. We did a gross motor for each of them. Plus as we did the gross motor we made their sound. The book starts with the rooster and we flapped our wings for the rooster. First is crawling on the floor for the cow, dog, cat, and goat. Each one had a slightly different part to it but we had fun doing it. We buzzed around the room like a bee. We got on the floor and swam like a fish. We squatted down and waddle like a duck. We moved quickly around the room like a scampering mouse. We crawled on our stomach like a snake. We did pretend climbing up a tree like a squirrel. We flapped our arms up and down like an owl. We pecked the floor like a hen. This was so much fun to do the animal movements while exploring the book. We read the book several times, just so they could do the movements again. It was a fun way to explore the book. This entry was posted in gross motor, reading and books and tagged farm, gross motor. Bookmark the permalink. So much fun. This would be fun to do indoors and outdoors. This looks like a blast! I’m going to see if I can find a copy of this book since my daughter has just started to work on her animal sounds.